As a board-certified allergist, I’ve seen firsthand how families struggle with food allergies. 1 out of 13 children in the U.S. suffer from food allergies, and over half of these children don’t have any history of food allergies in their families. Worst of all, food allergies can be life-threatening. Thankfully, findings from recent landmark studies show that you can reduce your baby’s risk of developing a food allergy by introducing them to allergenic foods early and often. The 5 tips below are based on findings from recent studies and will hopefully make allergen introduction easier, and help reduce your baby’s risk of developing a food allergy. 4-11 months of age is a critical window for allergy prevention, because that’s when a baby’s immune system starts to develop positive or negative responses to food proteins. If your baby eats allergenic foods consistently when they’re 4-11 months old, they’ll be less likely to develop a food allergy. So, start allergen introduction early -- take advantage of this window before it’s too late. Every baby should be healthy and under an adult’s watchful eye when introducing allergens. Pick a time when baby is healthy and when a caregiver can watch the child for at least 2 hours, in case of a reaction. And consult your pediatrician first before you introduce allergenic foods if your child has severe eczema. Feeding babies allergenic foods only once or twice won't reduce their food allergy risk. In the landmark studies, infants consumed allergenic foods 2-7 times a week for 3-6 months (or more). So, make sure to give your baby allergenic foods multiple times a week, for several months. Staying consistent with allergen introduction is just as important as starting early! Start with a smaller amount of the allergen, and then slowly increase the amount over time. Pediatricians and allergists recommend this approach because it maximizes safety. As a mom, I know firsthand how difficult allergen introduction can be. When my son David was 5 months old, I tried to feed him egg, peanut, and yogurt snacks several times each week (peanut, egg, and milk comprise over 80% of childhood food allergies). But this process was very time-consuming and frustrating, especially since most of these snacks ended up on the kitchen floor or on his face, and never made it to his mouth. Since many 4-6 month olds can be picky eaters, parents often struggle to follow the new guidelines on food allergy prevention, especially if their infant isn’t quite ready for solid foods. In fact, in one of the recent studies, more than half of the parents weren’t able to comply with the study protocol, underlining how challenging early and sustained allergen introduction can be. My clinical and personal experiences as an allergist and mom inspired me, along with my colleagues, to develop an easier solution for parents. 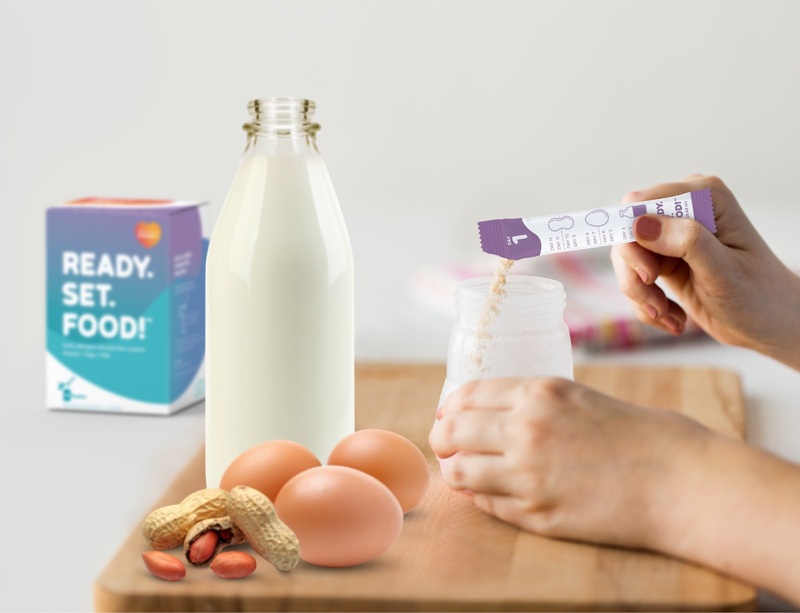 Helps reduce the risk of developing peanut, egg, and milk allergies by up to 80%. Follows the precise dosing used in the landmark studies on infant food allergy prevention. So,you can rest assured that your baby is consuming the right amounts of allergens. Contains only organic, non-GMO peanut, egg, and milk -- no artificial additives or added sugar. Gently increases the allergen amount over time and introduces 1 new food at a time. Easily dissolves into breastmilk, formula, or your baby’s favorite puree, making allergen introduction simple even if your baby is not developmentally ready for solid food. Is physician-approved: more than 200 pediatricians recommend Ready, Set, Food! To learn more about how Ready, Set, Food! 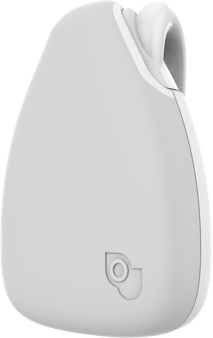 makes early allergen introduction easy, visit their website here. And for a limited time only, use the promo code (JIOBIT20) to get $20 off your Ready, Set, Food! subscription.